‘Tis the gift to be simple | When I Survey . 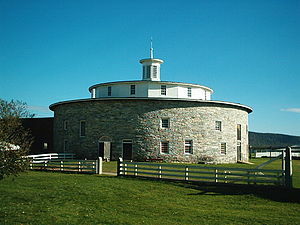 . .
Just down the road from my home in Pittsfield, Massachusetts is the Hancock Shaker Village, a living history museum on the site of a former Shaker community. It is a beautiful spot, with oft-photographed buildings such as this Round Stone Barn. Both my children worked there during their teen years, and my son was a costumed interpreter for a couple summers. The Shakers who once lived here at Hancock were part of a 19th Century utopian community. They practiced racial and gender equality, pacifism, celibacy (which was their undoing), and what they called “simplicity.” Simplicity meant placing a higher value on people’s spiritual life than on their possessions or achievements. The turning refers to movements in a dance, for the Shakers were known for their use of dance in worship. The lyric begins ‘Tis the gift to be simple, ‘this the gift to be free . . .” and there is a deep truth in these words. In a consumer society such as ours it becomes far too easy for us to derive our identities from our possessions. The irony is that in giving so much value to our possessions we let them possess us. They understood there was something deeply spiritual about simplicity. That less is sometimes more. That quality is more important than quantity. Can we learn from the Shakers ways of living and acting in simplicity that are, in today’s jargon, sustainable? In this regard the Shakers were ahead of their time, in knowing how to live simply in ways that were kind to the planet and help to insure a hopeful future for it and it’s citizens. ← Is there room in our hope for justice?